I have one toddler at home with me during the week. With everyone else at school I like to try and find activities that will help my youngest guy grow and thrive without weighing him down with things he would find boring. He loves arts and crafts, and he loves stickers. I recently started having him try to recognize his name. So we have been finding different ways to have him work on recognize his own name either by coloring it, tracing it, or playing games with it. 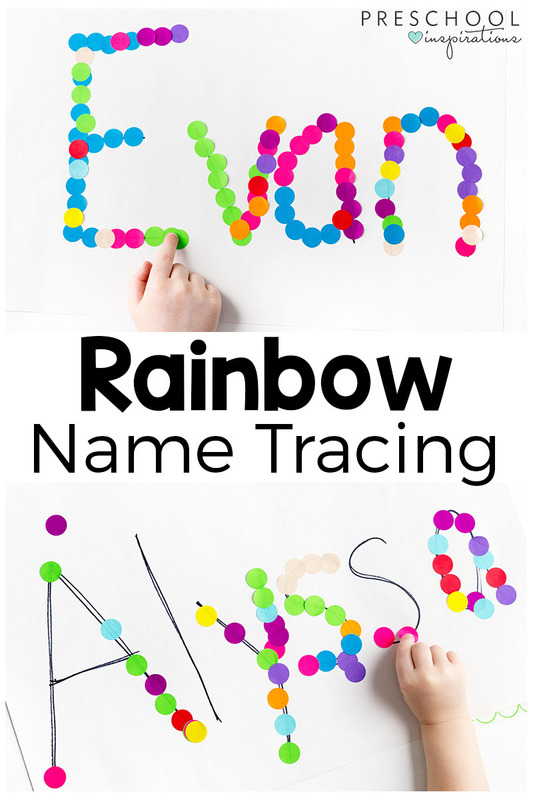 I loved this rainbow sticker tracing activity from Preschool Inspirations. It allows him to see and recognize his name while making it fancy and fun for him. He can choose any sticker color he wants, or all Captain America (his favorite) stickers. It is a great activity that helps with fine motor skills while still teaching the child their own name. You can even do this with the alphabet. It really is a simple and straight-forward way to begin the skill of spelling and recognizing their own name. It can also keep them busy for a few minutes while you finish loading the dishwasher or make lunch. For more incredibly easy yet educational based activities for toddlers check out Preschool Inspirations and get learning! This entry was posted in Activities and tagged Activities, educational activities, fine motor skills, l;earning, learning activities, learning time, letter learning, name learning, preschool inspirations, the boys store, toddler time, tracing on January 16, 2019 by Lacy.